Editor’s Note: The Energy & Income Advisor team will attend the National Association of Publicly Traded Partnerships’ upcoming MLP Investor Day, an annual event where we’ve uncovered some of our best investment ideas in recent years. Over this grueling two days, we’ll attend presentations from 81 master limited partnerships and talk to management teams during break-out sessions and one-on-one meetings. One of our goals this year is to kick the tires on a few names we’re considering for our MLP Portfolio’s aggressive sleeve. We’ll share our key takeaways from the conference and top ideas with Energy & Income Advisor subscribers in an exclusive online video report on May 22. Sign up for a risk-free trial today. Technologies come and go in the telecommunications space, but the importance of scale to profitability and earnings growth is forever. Regulators have long tried to overturn industry economics by fiat. For example, federal Judge Harold Greene in 1984 presided over the court-ordered breakup of Ma Bell into the so-called Baby Bells. And the Telecommunications Act of 1996 sought to further deregulate the industry. But government intervention hasn’t stemmed the sector’s relentless consolidation in the quest for scale, earnings growth and improved profitability–a trend I predicted in Power Hungry: Strategic Investing in Telecommunications, Utilities and Other Essential Services, published by Wiley in 2002. AT&T’s (NYSE: T) $48.5 billion acquisition of DirecTV (NSDQ: DTV) is the second major telecom tie-up announced this year. In February, Comcast Corp (NSDQ: CMCSA) announced the $45 billion purchase of Time Warner Cable (NYSE: TWC). Although the strategy behind these deals differs, the core purpose remains the same: to build the necessary scale to compete effectively in this capital-intensive business. Most analysts and consumer advocates focus on subscriber numbers. AT&T and DirecTV would control about 25 percent of the US pay-television market if regulators approve the deal, while the combination of Comcast and Time Warner Cable would boast a market share of about 33 percent. If Sprint and T-Mobile were to tie the knot, the combined company would have slightly fewer subscribers than industry heavyweights AT&T and Verizon Communications (NYSE: VZ). Before signing off on these mega-mergers, regulators will scrutinize the effect on regional markets. Comcast, for example, has agreed to sell some assets to Charter Communications (NSDQ: CHTR) to reduce its share in several markets. AT&T will likely to do the same, though DirecTV plays in a different sandbox. The Federal Communications Commission’s (FCC) fixation with having four national wireless competitors presents the biggest hurdle to Sprint and T-Mobile US getting together. However, either company could do a deal with DirecTV’s primary rival, DISH Network Corp (NSDQ: DISH), which faces a government-mandated deadline to deploy wireless spectrum but lacks adequate means to get it done. But market share isn’t the most important incentive for these deals. Simply put, larger companies can invest more heavily in capacity and network upgrades to keep ahead of the competitive curve. Superior network quality–not catchy marketing–wins the war for communications dominance. In the first quarter, no telecom company spent more on its network than AT&T. In the first quarter of 2014, AT&T invested $5.7 billion in its network while generating $8.8 billion in free cash flow. Meanwhile, Sprint outspent its cash flow by about $1 billion, and T-Mobile US generated $759 million in cash flow but sank $947 million into its network. In other words, AT&T spent about six times more on its network than either Sprint or T-Mobile US in the first quarter and still collected more than $3 billion in free cash flow to pay dividends, buy back stock or pay down debt. Sprint and T-Mobile US, on the other hand, took on additional debt and didn’t even pay a dividend. AT&T’s proposed acquisition of DirecTV will create considerable synergies, including the ability to stream entertainment on the wireless provider’s network. Management estimates that the two companies’ high-speed broadband network will cover 70 million customer locations, enabling users to watch TV over any device. AT&T will also gain DirecTV’s 18.1 million customers in Latin America–a region in which the wireless provider has looked to expand. 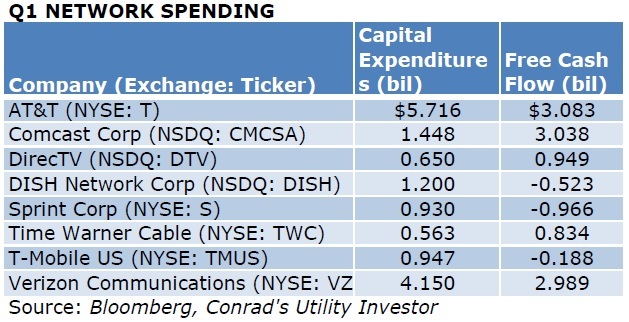 DirecTV last year generated $2.6 billion in free cash flow last year, augmenting the $11 billion that AT&T expects to earn in 2014 and widening its ability to outspend rivals. And given the acquirer’s long track record of successful integrations, investors shouldn’t be surprised if the telecom giant exceeds its free-cash-flow targets. AT&T will fund the purchase price of about $95.00 per share with $28.50 in cash and the rest in stock. A collar protects the value of the stock portion, locking in a number of shares to reach the $66.50 per share target. If AT&T’s stock fetches less than $34.90 at closing, DirecTV shareholders will receive a maximum of 1.905 shares; if AT&T’s stock rallies to more than $38.58, investors will receive a maximum of 1.724 AT&T shares for each DirecTV share. Any price between that is on a sliding scale to achieve a value of $66.50 per share. This arrangement limits the dilution suffered by AT&T shareholders and protects the telecom giant’s A- credit rating. Plans to sell the company’s 8 percent stake in America Movil (Mexico City: AMXL, NYSE: AMX) should smooth the way to antitrust approval south of the border. The friendly nature of AT&T’s takeover bid–and the 30 percent premium–should ensure shareholder approval. And given regulators’ rejection of a merger between DISH Network and DirecTV in 2002, the emergence of a rival bid appears unlikely. DirecTV would also owe AT&T a $1.445 billion breakup fee for accepting a higher offer. A handful of states and Latin American countries will review the deal. But the key challenges are antitrust clearance at the US Dept of Justice and what’s likely to be a full-on bargaining session with the FCC. Regulators likely will focus on the overlap of service territories between AT&T’s U-verse broadband offering and DirecTV. And the merger has already attracted scrutiny on Capitol Hill by virtue of its size, with a House of Representatives panel announcing a probe of the deal’s effect on consumers and competition. The FCC could vote to reject the AT&T-DirecTV merger and the union of Comcast and Time Warner Cable. Three of the five FCC commissioners are Democratic appointees, who will find themselves under pressure from lawmakers opposed to further consolidation. However, regulators likely will approve the deal, as long as AT&T agrees to sell some assets. The FCC may also use the proceedings to exact concessions related to net neutrality, which stipulates that Internet service providers won’t block websites or slow rival services. For its part, AT&T’s management has already offered to abide by the Internet rules the FCC proposed in 2010 for three years. These rules were struck down in court earlier this year and have no chance of passing the Republican-led House of Representatives; these merger negotiations are the FCC’s sole recourse. AT&T has also pledged to bid at least $9 billion in the government’s upcoming wireless spectrum auction, slated for later this year and in 2015. Previously, the company had threatened to abstain from the process in response to an FCC proposal to reserve some spectra for bids from smaller players. Other sweeteners offered by AT&T include plans to roll out its fiber network to 15 million new homes over four years, primarily in underserved rural areas. And the company would freeze the price of lower-speed DSL broadband for three years. Nothing is easy when it comes to communications mergers. But investors may be surprised by how quickly this deal closes. For one, it’s an obvious counterweight to the Comcast-Time Warner Cable tie-up, a merger that appears to be making its way to the finish line. The market’s muted reaction to the deal is another encouraging sign. In most mergers, the acquirer’s shares sell off initially because of worries about dilution and integration risk. Vodafone (LSE: VOD, NSDQ: VOD) is one potential loser from the deal; the London-based telecom outfit had been rumored as a takeover target as part of AT&T’s ambition to go global. The bid for DirecTV puts a blockbuster deal involving Vodafone on hold. Meanwhile, America Movil will find itself competing with AT&T for pay-television customers in Mexico and Brazil. Assuming that AT&T’s integration of DirecTV proceeds without any major hitches, the telecom giant could be in a position to accelerate its dividend growth rate. This potential upside, coupled with a low bar of expectations, make AT&T a good bet for conservative investors. I’ve covered AT&T and other essential-services stocks for almost 30 years, a level of experience that helps me to distinguish the real opportunities from the hype in Conrad’s Utility Investor. The holdings in my Aggressive Income Portfolio have generated an average return of 21 percent since its inception on July 31, 2013, beating the 12 percent total return posted by the S&P 500 over equivalent holding periods. 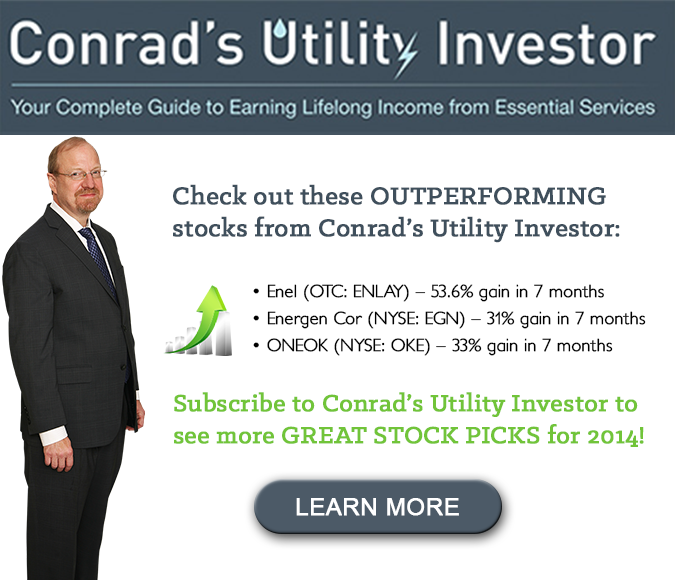 For more of my favorite stocks that pay dividends like clockwork and are poised for more upside, sign up for a risk-free trial of Conrad’s Utility Investor.